No additional freight & setup charges. Plus $79.00 doc fee, tax & DNR registration. 90 4-Stroke Engine: No time like the present to get your young riders hooked on riding. Our 2-valve, 4-stroke, 90cc, air-cooled engine is clean, quiet and fuel-efficient. The speed limiter tops out at 15 mph. Fully Independent Front Suspension: Little riders look for big performance. The swing-arm rear suspension keeps the machine balanced in the corners and provides confidence to take their riding to the next level. 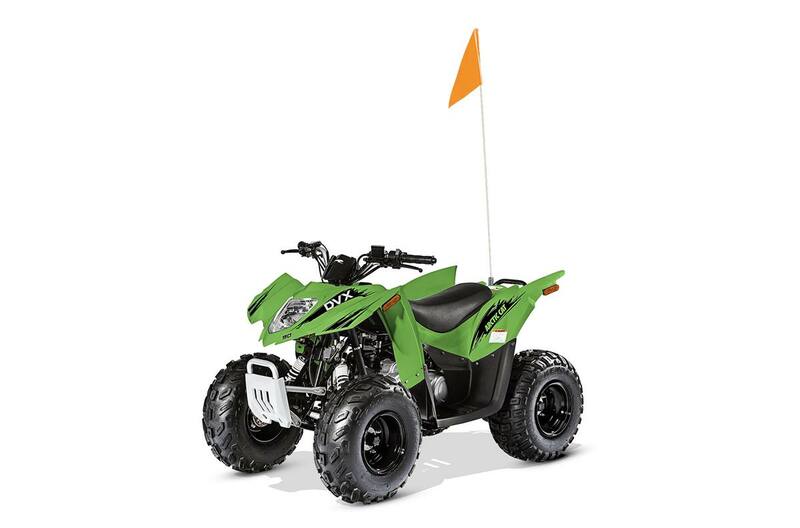 Digital Indicator Lights: This youth model comes with a green neutral and red reverse indicator light to let your little rider know what gear their machine is in. Working Headlight & Taillight: Sunset doesn’t mean the fun needs to stop. This machine lets you see and be seen – with a working headlight and a taillight that keeps you running safe. Safety Flag: There’s nothing more important than staying safe, and this highly visible, orange whip safety flag lets everyone know where your young rider is at all times. Kenda Tires & Powder-Coated Steel Wheels: These Kenda tires are reliable and provide added shock absorption.